A highly-decorated biscuit tin lived on our front room windowsill at 36 Ashfield Avenue. It was filled with family snapshots. 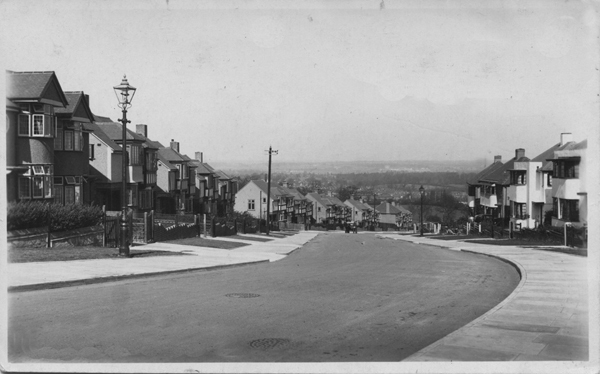 One of them was this postcard, showing our road as it was when we moved there in 1935. Just visible is the horse-drawn milk cart on the daily morning round. The houses at the top on the right had bay windows with curved glass: I was just ten years old and bitterly disappointed to find that we weren’t moving into one of these. They were very modern and would have been a good bragging topic at the new school when the other braggers weren’t nearby. But we did find that we had an already-installed telephone – unbelievable in the 1930s; an actual telephone. And that was very good material for bragging. Drama hit us late one afternoon. The hill was hardly steep, but you usually entered it at a fair crack from the main road and the gradient quickly speeded you up. My father was cycling home from work and looking forward to his bath and his slippers and settling down to the ‘News Chronicle’ with a cup of tea. He swung into our road and went freewheeling down the hill. As usual, he began braking as he passed that gas lamp on the left. But this time his brakes didn’t work. He was going too fast to jump off; he couldn’t even relax and depend on an uphill stretch at the bottom to slow him down; across the bottom was a five-barred gate barring the way to the grazing fields beyond. He was probably now going faster than he had ever been before. Then he saw at the very bottom of the hill, on the left, a big pile of builders’ sand. It was half on the pavement, half in the road. He aimed for it. As he hit, the bike buried itself and he went into a tight somersault over the handlebars and on to the heap. It saved him. My memory is of hearing a rattling of keys at the front door and opening it and seeing a very sandy father looking at me through sand-encircled eyes. This entry was posted in Autobiographical and tagged 1935, Ashfied Avenue, drama, no brakes, snapshots, telephone on 16/08/2012 by Paul.